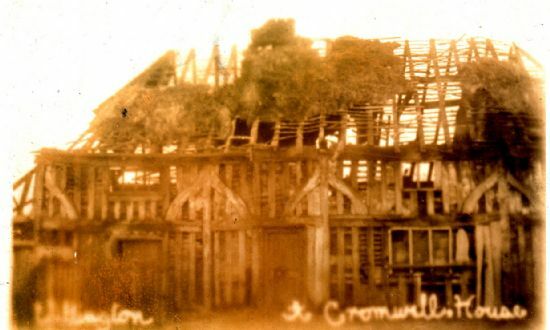 A wonderful photograph of Cromwell House, a timber framed building dated 1630 or 1631, but most certainly of an earlier construction. It was dismantled and taken to America in the 1920s by Leslie Buswell, a great grandson of Admiral William Croft. Buswell incorporated the timbers into a house he built in Gloucester, Massachusetts, which he named Stillington Hall. An view of Cromwell House which shows the structure of the building beautifully. All of the daub has gone exposing the wattle between the timbers and only a little thatch remains on the roof so the purlins are clearly visible. Undoubtedly the wood that built this house came from The Forest of Galtres, with ten to fifteen oak trees felled to enable its construction. 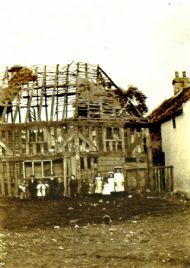 The house has been dated between 1450 and 1530 on the evidence of this photograph. 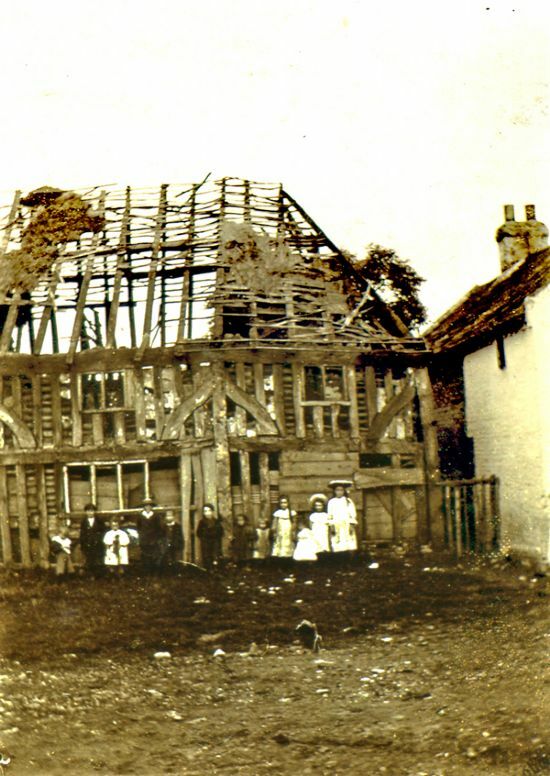 The roof is thought to be of a later date as it is not a cruck roof, as would be expected, though cruck timbers can be seen in the first floor. 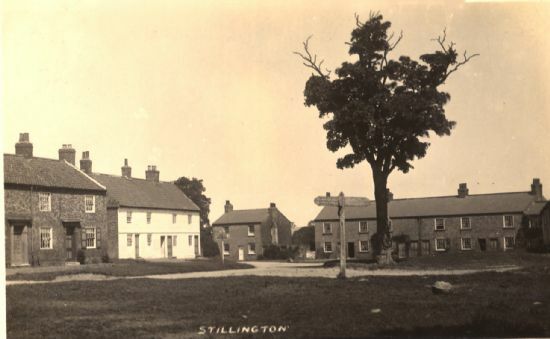 The question is - was this building the first Stillington Hall? East side of the Green. Cromwell House is just visible in the top left corner. 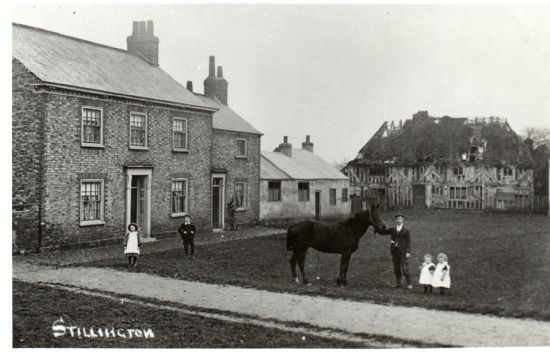 The two terraces of cottages were known as 'The Wasps' Nest' and housed some of Stillington's poorest families. 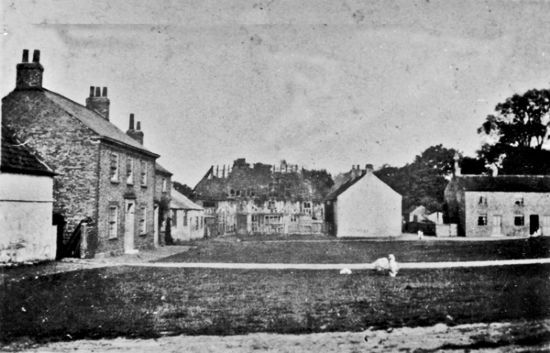 The house in left foreground,Woodville, has no bay windows, which it has today. 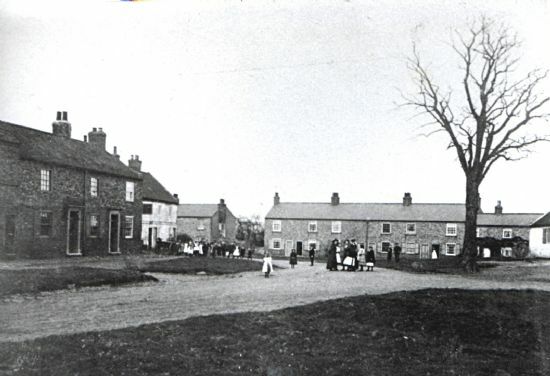 The White Cottages in the background were demolished. 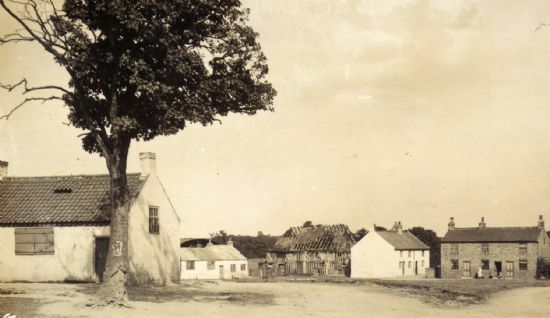 Jack Lane corner with The National School to the right. Pupils at play can be seen. 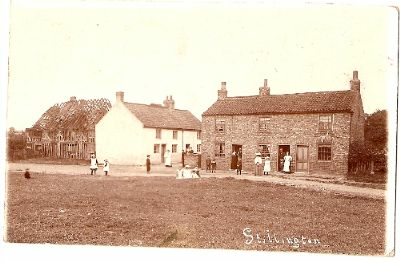 To the left is The Boot and Shoe Inn (start of the white cottages). This scene shows the eastern end of The Green clearly. A road ran behind the buildings there and led out onto Mill Lane. 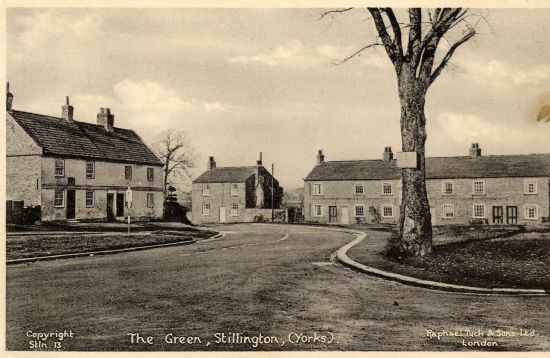 The Green as viewed from the entrance to North Back Lane. Cromwell House is once again in the view. The National School is not in use but as yet not converted into the Village Hall. Looking down Jack Lane. The school has been converted into The Village Hall - there's a patch of render still visible and that remains to this day. 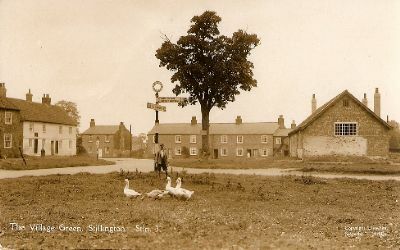 The boy standing at the road junction with the geese is Cecil Wood. 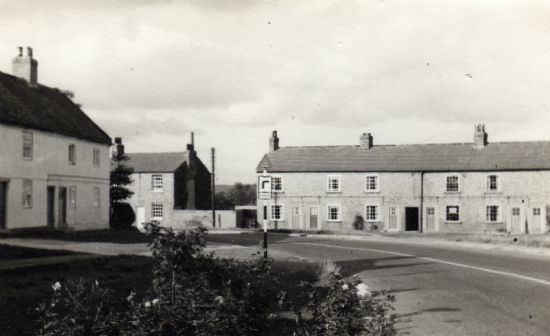 The house in the middle of the picture was demolished in the 1950s to make way for road widening. The wooden sign post points the way to Crayke, Easingwold and Thirsk. 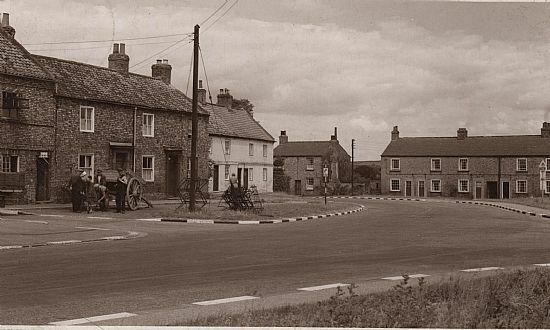 Small sign outside the white houses warns of "Danger Double Bend"
Jack Lane corner showing houses demolished during a road widening scheme. The sycamore tree stands at the Mill Lane Junction. A sign can be seen over Boot and Shoe Cottage. An almost identical scene to the one opposite. Both images are from postcards by Raphael Tuck. Another great view of Jack Lane, this time a postcard by Lilywhites. In the upper left corner men can be seen working on a cart outside Hugh Morse's smithy. There is also iron work propped up.